Candis Welch with Jay Ellis, one of the stars of HBO’s Insecure. Photo courtesy of Candis Welch. When Candis Welch was studying journalism at California State University, Northridge in 2008, she couldn’t have imagined the professional worlds she would inhabit or the adventures that life had in store. She did not know that one day she would be working two full-time jobs — as an executive assistant for the lead actress and co-creator of HBO’s Insecure, Issa Rae, and as a procurement analyst for the Los Angeles Homeless Services Authority. Welch knows what it means to persevere in the face of difficulties. 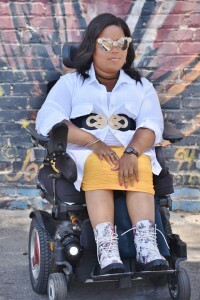 She had to deal with the loss of her father in high school, was a first-generation college student and faced the challenges brought on by a diagnosis of spinal muscular atrophy, a genetic muscular disorder that makes it difficult to perform basic functions such as walking or sitting up straight. As an undergrad student at CSUN, Welch worked multiple jobs, ​​​commuting long distances between Northridge, Long Beach, Inglewood, and Los Angeles. After obtaining her bachelor’s degree in journalism in 2011, she took a job working for the County of Los Angeles in the auditing and control department. “I was good at my job, but I wanted to challenge myself and do more for the community,” she said. She left her “cushy job” with the county to pursue a career as an entertainment publicist. Candis Welch poses with Y’lan Noel, one of the stars of HBO’s Insecure. Photo courtesy of Candis Welch. She returned to CSUN as a graduate student with a focus in public administration, and began working toward her MPA. While a graduate student, she serendipitously found a job as an executive assistant for Rae through a friend. 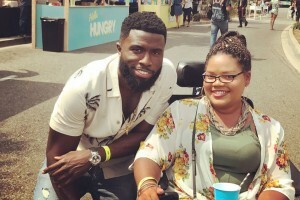 Rae is best known for her role as the lead in HBO’s ​​series Insecure​, for which she is also the creator and co-writer. Rae first received recognition for her YouTube series Awkward Black Girl​, which she created, wrote and starred in. 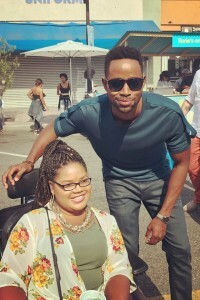 Welch began working for Rae at the start of the second season of the web series, and more than five years later they are still working together as they wrap up the third season of Insecure. Welch’s job as an executive assistant involves coordinating Rae’s calendar and daily life, including taking meetings with HBO executives, organizing and delegating tasks and coordinating and managing Rae’s production company, Issa Rae Productions. Upon graduating with her MPA in 2016, Welch took on the additional job of working for the Los Angeles Homeless Services Authority (LAHSA). She said her work with LAHSA offers her the opportunity to help others, giving her the purpose she was looking for. Welch is committed to doing both jobs well. “Issa is not someone I pick up in my off-time; it’s a full-time job, just like LAHSA,” she said. Her job at LAHSA includes drafting grant proposals in both the City of Los Angeles and Los Angeles County, working in case management and going out into the field to check on the status of current shelters. “I make sure these shelters actually provide the services they are supposed to provide,” Welch said. Candis Welch. Photo courtesy of Candis Welch. With that in mind, Welch encouraged fellow Matadors to get involved with their community. She advised current students to remain determined and stay focused, no matter what hurdle stands in the way.